This article describes the coinage, wages and the cost of living in London from the late seventeenth century to the beginning of the twentieth century. Pounds, shillings and pence were the basic currency of Britain throughout the period covered by the Proceedings, having a consistent relationship of 12 pence to the shilling and 20 shillings to the pound. Values are generally expressed as £.s.d., or else l.s.d., as in £12 10s. 6d. or twelve pounds, ten shillings and sixpence. The pound sign stands for Libra, a pound weight in Latin, the s. is an abbreviation for shilling in English, and the d. stands for denarius or denarii (a Roman coin). You will also find references to guineas, with a value of 21 shillings (this value could change depending on the quality of the coinage in use), marks (13 shillings, 4 pence), nobles (6 shillings, 8 pence), crowns (5 shillings), half crowns (2 shillings, 6 pence); and coins worth 6 pence, 3 pence, 2 pence, halfpence and farthings (one quarter of a penny). Five, two, one and half guinea coins were made of gold and were introduced after the recoinage of 1696; crowns, half crowns, six pence, and three pence coins were all silver; as were all pennies and two pence pieces until the introduction of machine milled one and two pence copper coins in 1797. The last silver English penny was minted in 1820. Farthings and halfpence were made from copper. During the eighteenth century a range of foreign currency was also in circulation, including pieces of eight, ducats and dollars. 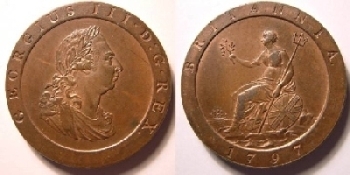 The general lack of coins encouraged the use of trade tokens, which reached their greatest circulation in the last decades of the eighteenth century, before the Bank of England began to commission the production of a larger quantity of particularly small denomination copper coins. The Bank also introduced £10 and £15 notes from 1759, and notes of higher and lower denominations later in the century. Troughout the period up to the 1830s, the supply of coinage and currency remained a significant problem. Clipping and counterfeiting were particularly common and seen as especially heinous in the period leading up to the great recoinage of the 1690s. In the ten years prior to 1696 over four hundred coining offences are recorded in the Proceedings, representing over 10% of the court’s business. These offences declined in the first half of the eighteenth century, but became more frequent again from the 1760s. Throughout the nineteenth century a large number of men and women appeared at the Old Bailey charged with making and passing counterfeit coins. In terms of sheer numbers of cases, coining offences reached their high point in the 1860s, when over 2,300 cases were heard. 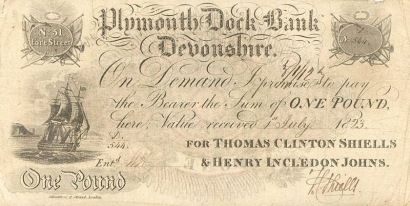 A £1 banknote issued by the Plymouth Dock Bank in 1823. As well as coining offences, the rapid development of bills of exchange, small denomination bank notes issued by both the Bank of England and a large number of independent provincial banks, ensured a constant stream of forgery cases (the act of forging banknotes became a capital offence in 1697, while passing, or "uttering" forged notes became capital in 1725). During the Napoleonic Wars (1793 to 1815), the Bank of England was forced to suspend the convertibility of its currency with gold and to produce a series of new forms of currency. Between 1797 and 1821, the period known as the ‘restriction’, new, primarily copper coins and, most importantly, inexpensively produced £1 and £2 notes were brought into circulation. The poor quality of these notes led to a spate of forgeries, which in turn led to a high number of prosecutions led by the Bank itself, for both forgery and uttering forged notes. You can search the Proceedings for cases of forgery, and the Associated Records for the Bank of England's records relating to many of these prosecutions between 1719 and 1821. Following the legal prohibition of most forms of trade tokens in 1817, and the collapse of many small provincial banks in the financial crisis of 1825 and 1826 (which helped to eliminate a wide range of competing forms of paper currency), British cash became more stable from the early 1830s. The death penalty for forging bank notes was changed to transportation (and later imprisonment) for life in 1832. At the same time, other financial instruments grew in ever greater complexity, opening the way to new forms of fraud and theft. Railway stock from the 1840s, and postal orders from 1881, took on many of the functions of currency, and were duly forged and stolen. As the nature of the Central Criminal Court changed, particularly after 1834, fraud and forgery cases came to represent a growing proportion of trials. Whereas forgery and coining comprised less than 5% of all trials during the eighteenth century, by 1850 this figure had risen to over 20%, and remained between 10% and 20% of court business until the early twentieth century. During the eighteenth century wages could be as low as two or three pounds per year for a domestic servant, plus food, lodging and clothing. 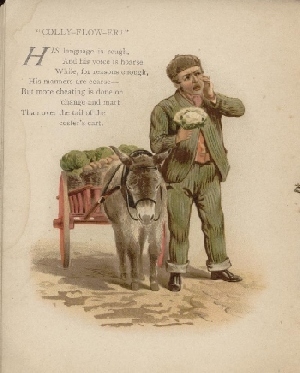 A beggar would normally hope to be given between a farthing and two pence in alms, while a parish pauper could hope for a weekly pension of between a few pence and a few shillings. For a young boy chopping wood the going rate was 1 ½ pence per hour, while a porter could expect a penny for shifting a bushel of coal. A waterman would expect six pence to take you from Westminster to London Bridge, while a barber asked the same to dress your wig and give you a shave. Female domestic servants earned less than men. Wages for eighteenth-century women could range from the £2 or so mentioned above to between £6 and £8 for a housemaid, and up to £15 per annum for a skilled housekeeper. By contrast a footman could expect £8 per year, and a coachman anywhere between £12 and £26. Because they had to provide their own food, lodging and clothing, independent artisans needed to earn substantially more than this. £15 to £20 per year was a low wage, and a figure closer to £40 was needed to keep a family. The middling sort required much more still and could not expect to live comfortably for under £100 per year, while the boundary between the "middling sort" and the simply rich was in the region of £500. The First Lord of the Treasury enjoyed an annual salary of £4,000. Over the course of the nineteenth century, these wage patterns changed very slowly, as did London’s pattern of employments. Although the centre of global trade and Britain’s largest manufacturing city, London was relatively little changed, beyond the revolution in transportation brought by the railways, by the mechanisation associated with industrial production. Through at least the middle of the nineteenth century most people continued to work in small manufactories; or from home on a piece rate in sweated trades. Clerking and financial and legal services became more common occupations in the second half of the century, swelling the ranks of the "middle classes". For most trades, wage rates throughout the period covered by the Proceedings changed little. In the hundred and sixty years between 1700 and 1860, for instance, a carpenter’s daily wage rose only gradually and intermittently from 2s. 6d. per day to around 5s. per day. By the middle of the nineteenth century, a skilled engineer could command 7s. 6d. a day, or around £110 per year, if fully employed, but this was not significantly more than their eighteenth-century predecessors. In the last decades of the nineteenth century William Booth estimated that a working family needed an income of at least 18s. to 21s. a week, or around £50 a year, just to get by, and 22s. to 30s. a week (£57 -£78 per annum) to be "comfortable". Much more variable was the "real wage" or cost of living experienced by most Londoners. Some items were much more expensive than their modern equivalents. In the eighteenth century, for instance, clothes in particular represented a much higher proportion of normal spending than they do now. A man's suit could easily cost £8, while even the uniform of a child looked after by the Foundling Hospital cost £1 12s. 10 ½d. Rent was also a more substantial component of most people’s budgets than it is today. Two pence a night would get you a shared bed in a cheap lodging house, while an inexpensive unfurnished room could cost 1s. 4d. per week. In order to gain a settlement, however, one needed to rent a house for £10 per year. 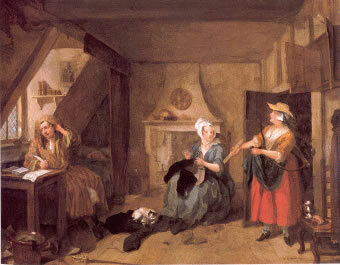 In the 1760s, a young gentleman like James Boswell spent £40 per year renting a set of rooms. 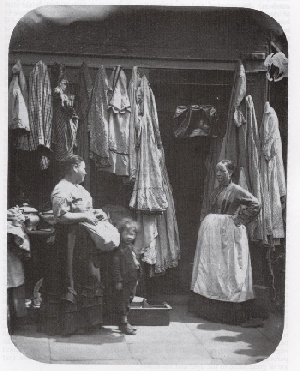 'The Old Clothes of St. Giles' (1877), from John Thomson, Victorian London Street Life in Historic Photographs (1994). By the end of the nineteenth century, some prices, particularly of manufactured goods, had fallen significantly. Clothing and apparel of all sorts became cheaper and more readily available as machine made fabrics replaced their handmade predecessors. By 1888 a skilled clerk could expect to buy an outfit suitable for Sunday best for £2. 10s; and a workday suit for £2. Furniture likewise became much more affordable. Expectations in relation to housing rose with the ever expanding suburbs. Renting a terraced house suitable for a senior clerk, his family and at least one live-in servant could easily cost £100 a year; but this outlay would purchase a level of domestic comfort that would have been the envy of even well-to-do eighteenth-century Londoners. While inner city and slum accommodation remained both widespread and of poor quality, it continued to be available for a low price. Throughout the nineteenth century the East End in particular attracted waves of new immigrants who shared cramped and squalid rental accommodation of a sort that would have been all too familiar to their eighteenth-century predecessors. What people chose to consume also changed. Beer and gin drinking went into relative decline in favour of tea, coffee and tobacco; and travel and leisure activities were increasingly popular. Day excursions, the music hall, and restaurants for the better off all became more important areas of expenditure. Nonetheless, the most significant and variable item of expenditure remained food. The price of bread, the commodity most commonly used to measure historical change in the cost of living, reached its high point in the first half of the 1810s, when a four pound loaf of bread was priced at over a shilling. For most of the period on either side of the turn of the nineteenth century, the equivalent price was between five and ten pence for the same loaf. In normal times, the more manageable one pound loaf of bread could be purchased for a penny-farthing or happence. Many Londoners, even the poor, preferred to purchase their food ready-made. One and a half pence could buy you a meal at an Irish ordinary. If you wanted something rather more filling you could try a three penny ordinary, where a meal of meat and broth and beer was available for the advertised price. A quart of beer could be purchased for a penny, and a cup of coffee for the same price. Gin ordered by the quarter and half pint would set you back a penny and two pence respectively. In the nineteenth century more formal restaurants were added to the options available for eating out, while the growing quality of suburban housing stock ensured that a growing proportion of the population had the facilities to cook their own meals for the first time. But, as repeatedly recorded in the Proceedings, many Londoners chose, or were forced to, steal the commodities they needed and wanted for their daily lives. See What People Stole.